Which extensions can be attached to the children’s desk? Nothing changes in a person’s life as fast as it does in children and adolescents. That does not just affect the height of your child, often, this is also the amount of space your child needs to do all his or her job. The number of activities your child does at the children’s desk also increases and multiplies. If at first it might be crafting and painting, writing and reading will come with age. And everything needs its certain place. A little later, it is the computer monitor or the small library needed to do the homework. The moll company knows about this problem and has developed desktops that simply grow with the needs of your child. Later and in many different directions and dimensions. Only a few desks are able to grow up with your child. The moll children’s desk also grows in width and thus creates more space on the table surface. How does it work? The matching add-on parts increase the work surface easily to the left or the right. In addition, the intelligent grid system; this extension can also be adjusted separately to the table height. It is not possible to add more flexibility. However, the growth potential of the moll children’s desk has not yet been limited. In addition to the width, the moll children’s desk can also grow in depth. The reason is simple, because in the nursery, it needs more room depth than the wall width available. 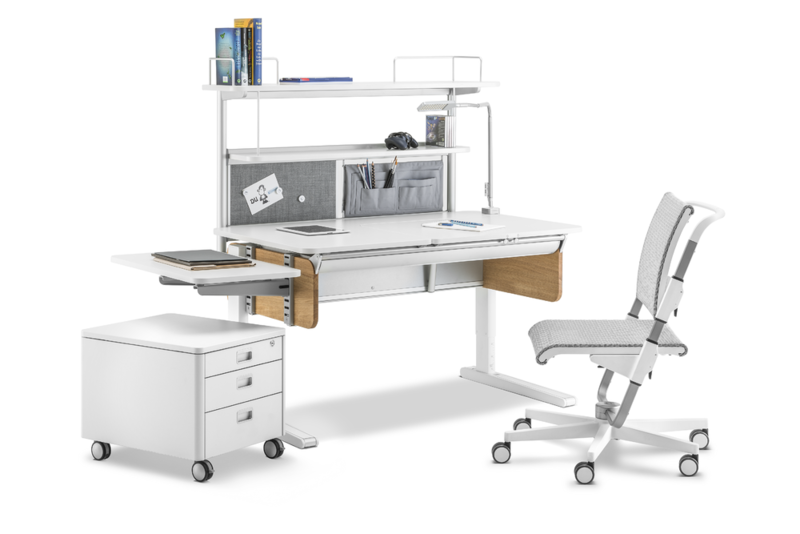 You can obtain more depth in the moll children’s desk through the appropriate extensions. The moll children’s desk offers your child more than a work surface exactly where it is needed. The installation is very easy. The extensions are easily attached to the back of the desk. If the space required for a monitor, the tabletop with a multi-deck is deep enough to provide sufficient space for this work tool, and above all, to ensure the distance of at least one arm length between monitor and seat position. This is also part of the ergonomics at the children’s desk. In addition to the width and the depth, is still missing the growth direction height. Efficient work also means having the most important documents always at hand, such as books and folders. To make this possible, moll has developed a two-tier shelving system. The Flex Deck is a special and unique shelving system that attaches directly to the moll children’s desk. Incidentally, a magnetic pin board was processed into the shelf attachment so that your child can staple his notes there. The moll children’s desk simply grows with your child with these variable, more expansion options.